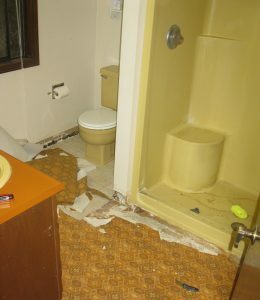 This is the 4th post about our bathroom remodel. For more information about each step of this process, click here. 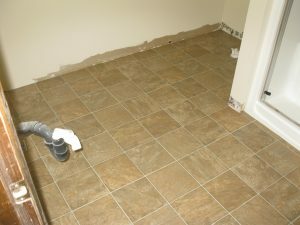 The next task on our bathroom remodel was to replace the vinyl flooring. 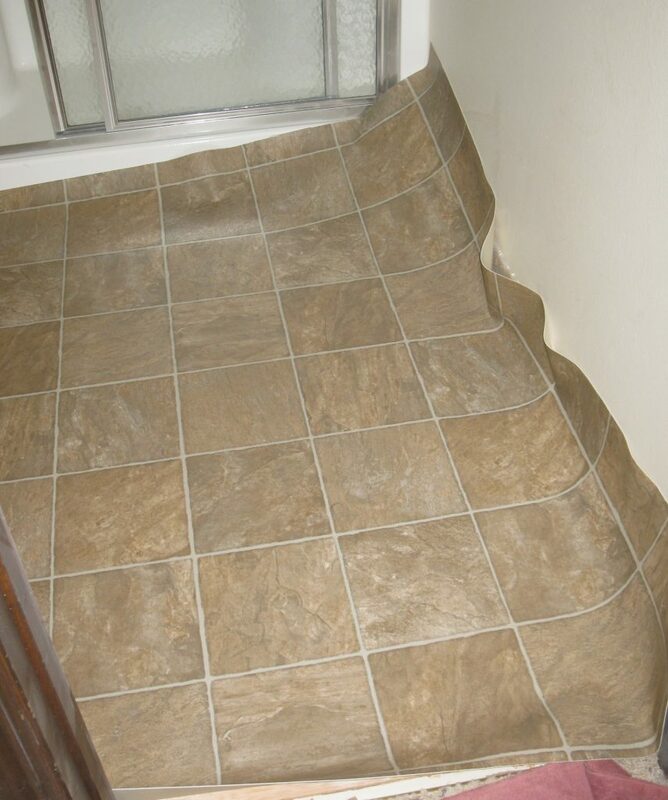 We had flooring laid (by an outside contractor) before we moved in nine years ago so the flooring was the newest feature in the bathroom. 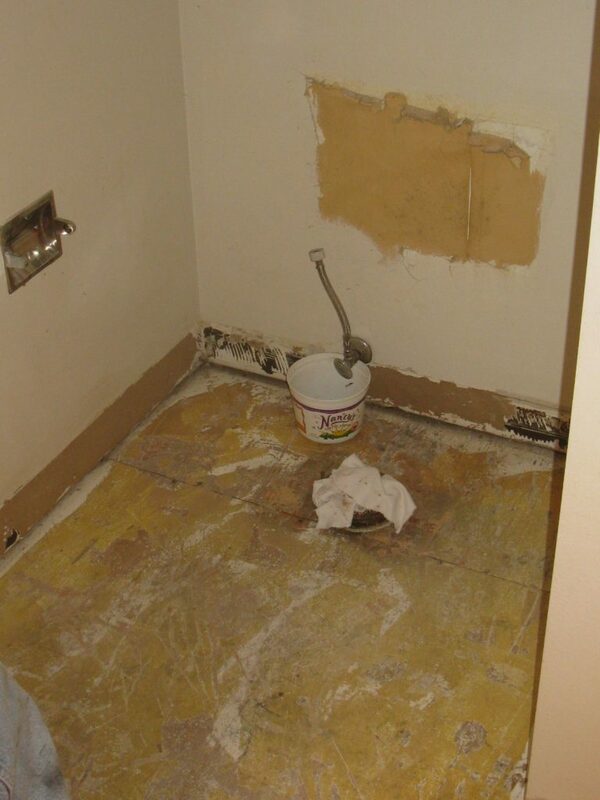 When we first started this remodel, we did not intend to replace this relatively new flooring. Two factors changed our minds about that: 1) we decided to rebuild the sink cabinet (because it wasn’t structurally sound enough for our liking) and that would change the footprint of the cabinet on the flooring exposing an area not covered by the current flooring; and 2) it was damaged from water leakage near the shower doors. We found a vinyl flooring style that we liked at Home Depot which also coordinated with a counter top we bought to put on our newly-built sink cabinet. 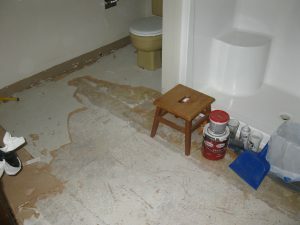 The flooring cost about $100 and the adhesive to install the flooring was in addition to that. 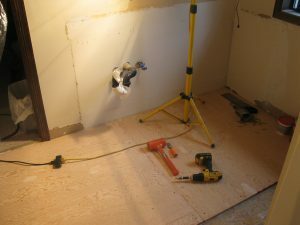 The flooring install was a multi-step process. We decided to pull up the previous layers of vinyl rather than just adding another layer to the stack. 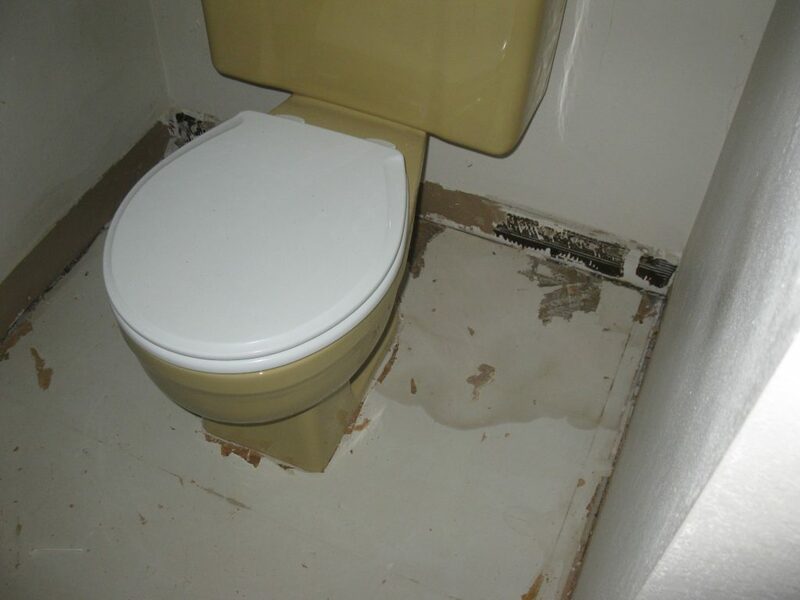 If you remember early on in the remodel, we were surprised to find that the wood under the vinyl layers (called underlayment) was particle board that had degraded with some water exposure near the shower. 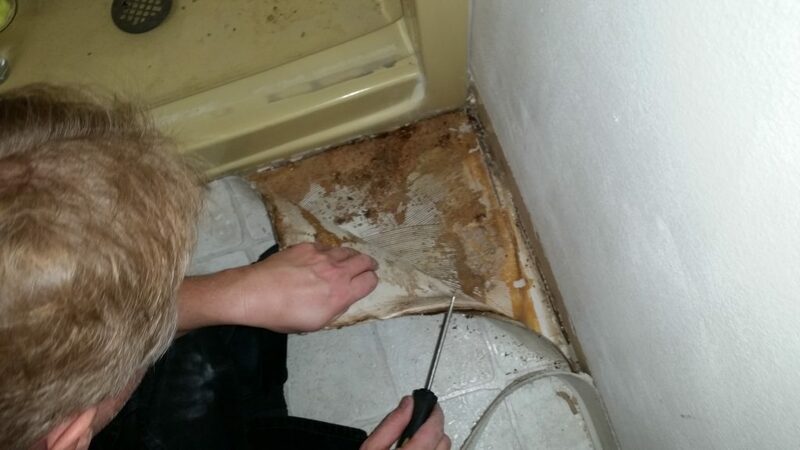 We thought we might remove the water damaged section of underlayment and just replace it, but as we pulled back the vinyl layers we realized we had a messy surface with flooring glue residue and actually two areas of water exposure to deal with. 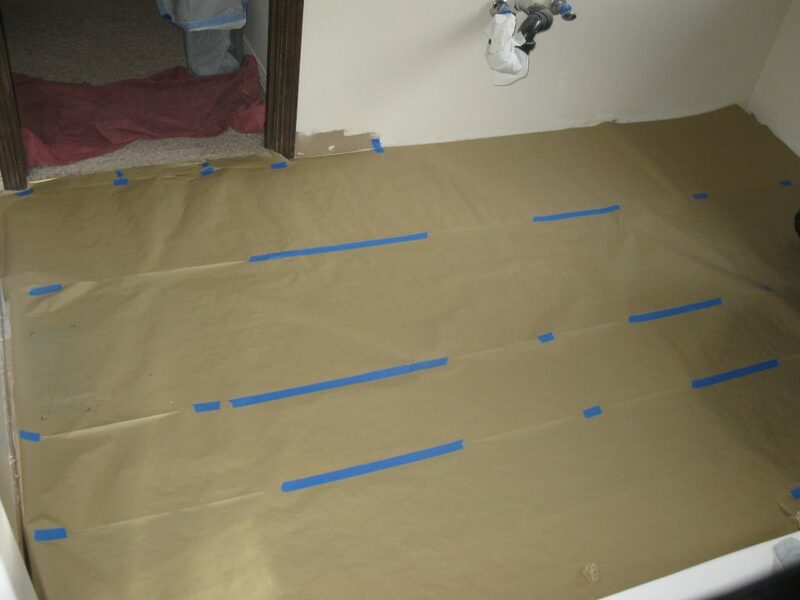 In order to give our vinyl install the smoothest surface we could and to eliminate the water exposure on the underlayment, we decided to remove the underlayment and replace it with plywood. 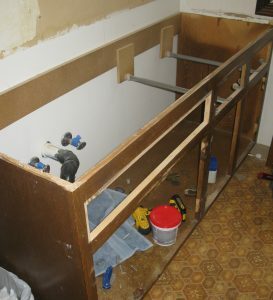 This job required that we remove the sink, cabinet and the toilet. After we removed the toilet, we found that we had a leaky shut-off valve so replacing that added another step to our job. We were pretty tired of the “mushroom” effect by now. It seemed that everything we touched added to the jobs on this remodel! We were grateful when we got to the point of putting the bathroom back together, rather than removing and repairing parts of it. Once we had the plywood installed, we began the vinyl installation. Our first step was to sweep up all the debris that was on the floor. 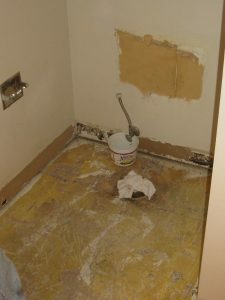 We wanted a nice clean surface to adhere the flooring. 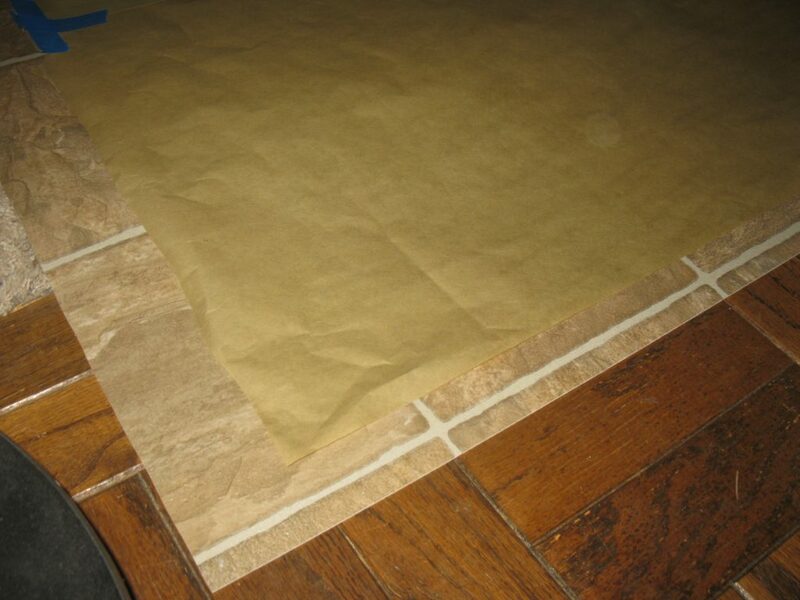 Then we made a paper template of the floor layout. Our next step was to use that template on the large piece of flooring from the store. We laid the store flooring out on our living floor since that was our biggest clean space to work. We cut around the template leaving several inches in each direction. Next, we brought the cut vinyl to the bathroom and began cutting it precisely to fit the floor. This process requires careful attention at the corners and under the doorjamb. 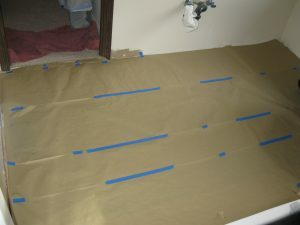 We then loosely folded back half of the vinyl flooring and began spreading an even layer of vinyl adhesive on the underlayment plywood. We used an adhesive scraper to spread the glue as evenly and thickly as we thought necessary. Next, we laid the folded-over vinyl on to the glue (careful not to get glue on the top side of the vinyl – if you do, wipe it off with a warm, damp cloth immediately) and used a clean adhesive roller to push out the air bubbles. We found that we squeezed out a good amount of glue to the edges, so we decided to lay it not so thick under the other half of the flooring. Then we let that dry for a day or two so that we wouldn’t be standing or kneeling on the flooring until the drying time has passed. 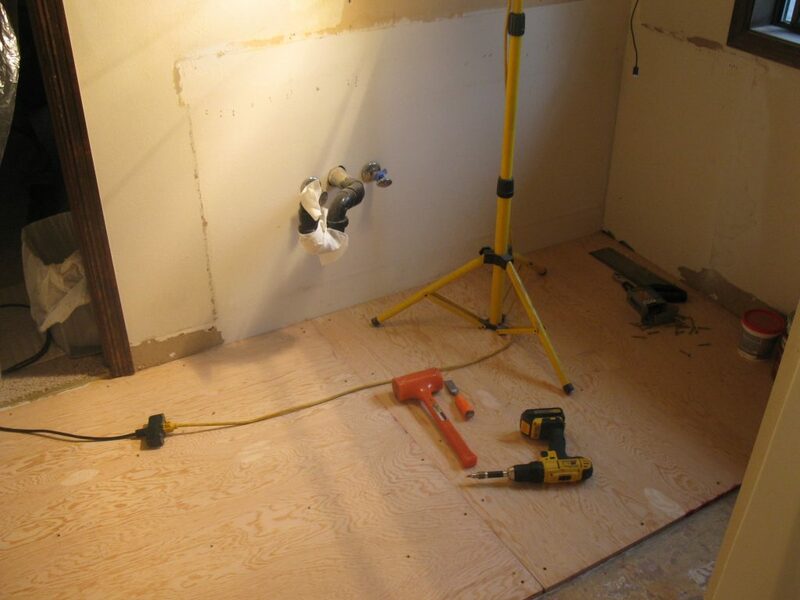 Once the drying time has passed, we followed the same steps to do the other half of the flooring. FINALLY – we had a bathroom floor again. the 70’s style vinyl we found underneath our top vinyl layer. the spindly structure of the sink cabinet inspired us to get rid of it.